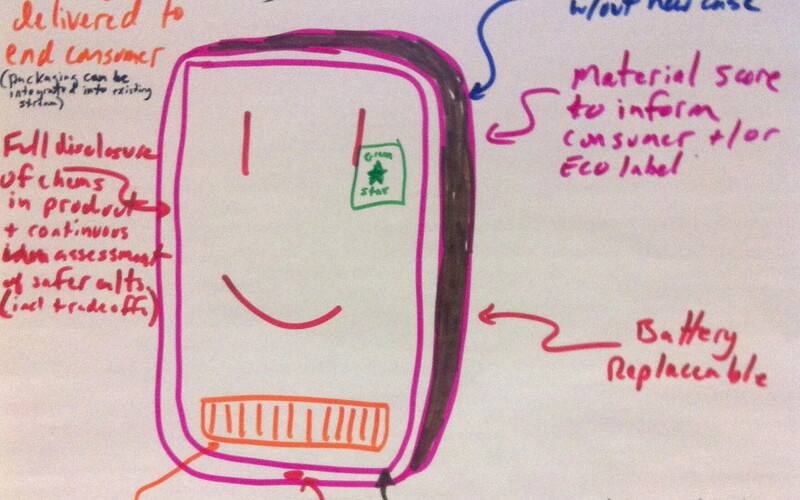 In July of 2012, I and my colleague, Susan Worthman, led a group of experts from all over the mobile phone industry through a series of exercises, over two days to imagine how mobile phones could be more sustainable. Our frame for sustainability included not only materials and recycling but social and cultural issues as well as new business models. The charrette was hosted by the Lowell Center at the University of Massachusetts University of Massachusetts at the Santa Clara University campus. Participants were selected from a broad cross section of the cell phone industry, including manufacturers, service providers, and suppliers, along with representatives from NGOs, waste disposal industries, and other sustainable design experts. They collaboratively explored opportunities for increasing the sustainability of mobile phones, and the business and social ecosystems that surrounds their design, manufacture, use and disposal). The participants identified many challenges and potential solutions throughout the mobile phone life cycle and across a wide array of stakeholders. The synthesis of these observations were combined into three sets of concepts that might be achieved, grouped across three time periods: within 2-5 years, 5-10 years, and more than 10 years. the need for more explorations of this type and across the variety of domains touched here (and not merely the standard manufacturers and NGOs). phones that are easier for customers to disassemble, replace parts, update, repair, and recycle. I think that many who attended were pretty skeptical, in the beginning, that there was new ground to cover or that there ere new solutions to be found. Afterward, however, I think that everyone saw new opportunities that didn’t occur to them before. The report is posted on my site, as well as the templates we developed for the charrette, itself.